Rajamudi rice is an indigenous rice variety of Mysore region. The high nutritional value and the low glycemic Index of this reddish brown rice makes it a diabetic friendly and anti-obesity food. 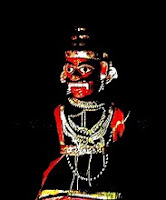 The Mysore Wodeyars encouraged the farmers to grow Rajamudi rice and collected the tax in the form of rice. After highly polished white rice took precedence the indigenous varieties were virtually pushed into oblivion. There has been an increase in health awareness of late, hence the nutritious indigenous grains are making a slow and steady come back. 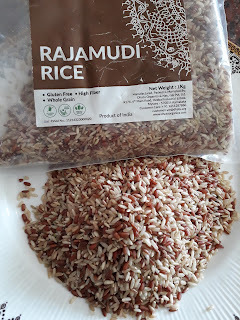 I picked up a packet of Rajamudi rice at Foodworld with a bit of apprehension. But my first attempt in cooking the Royal Rajamudi turned out to be a success. 1. 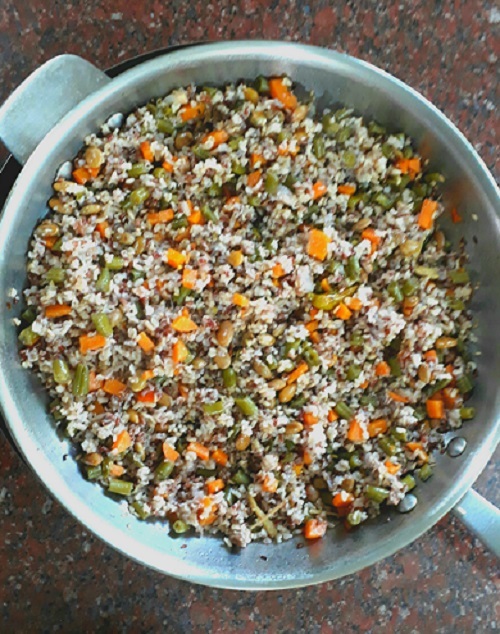 Wash and drain the reddish brown Rajamudi rice and keep aside. 2. Chop and prepare all the vegetables. 3. 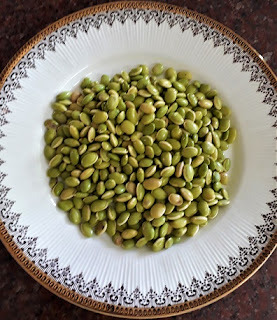 Heat sesame oil in a heavy bottomed pan and splutter cumin seeds, cardamom, cloves and cinnamon. 4. Add slit green chillies, slivered onion and ginger. 5. Saute till onion turns translucent and then add the washed and drained rice. 6. Stir till all the water evaporates and add the vegetables. 7. Add salt and stir well. 8. 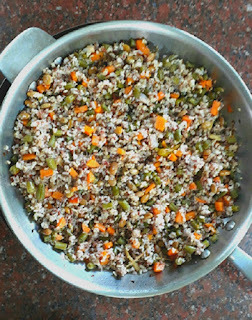 Add 3 cups of water for the rice and 3/4 cup of water for the vegetables into the pan and stir well. 9. When the water starts to boil decrease flame to 'sim' and cover the pan with a lid. 10. Open the lid and stir after ten minutes and immediately close the lid and allow the rice to cook. 11. After ten more minutes check if the rice is cooked by squishing one grain between your fingers.Sprinkle some more water if necessary and continue to cook.The Rajamudi Vegetable Pulao will emanate a very pleasant aroma when done. 12. Switch off the flame when done. It takes about 20 to 25 minutes for the rice to cook on low flame. 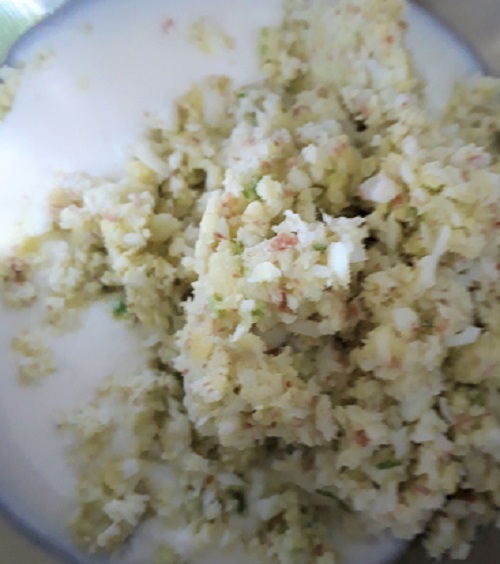 Allow 15 minutes for the nutritious pulao to settle and then savour the hot, flavoursome and a pleasantly pink coloured Rajamudi Vegetable Pulao with onion raita and pickle. "Black Gold!" "The King of Spices!" 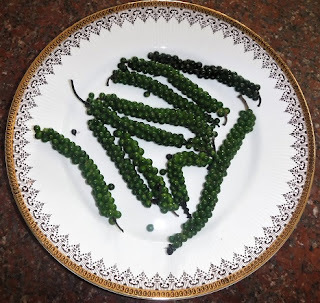 These were the glorious names given to Black Pepper, the most sought after spice from our God's own country. 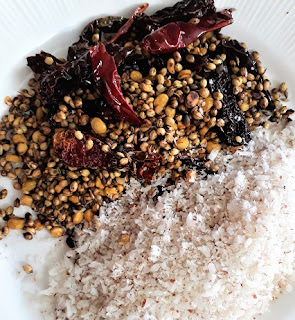 In ancient times the markets of coastal Malabar milled with foreign traders who yearned for this expensive spice. It is not surprising that Black gold or the expensive Pepper was used as currency then. New trade routes called as Spice Routes were developed with the intention of acquiring and monopolizing the trade of the King of spices. A peek into the history of Black gold makes my heart puff up with pride as I crush our own historic spice in a pestle to spice up my every day food. Peppercorns grow in clusters like tiny bunches of grapes on the pepper vines. The ripe green peppercorns are harvested and dried, and sold as black peppercorns which are used as spice. During the season the unripe and fresh green peppercorn clusters available in the market are pickled with lime or preserved in brine. 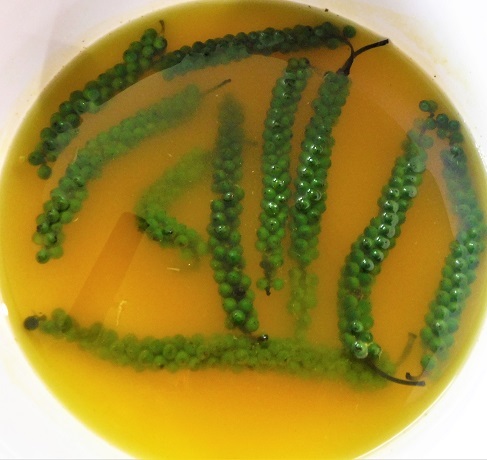 Kurumilagu Oorugai or green peppercorns in brine is a delicacy which is a must in every meal during the season. 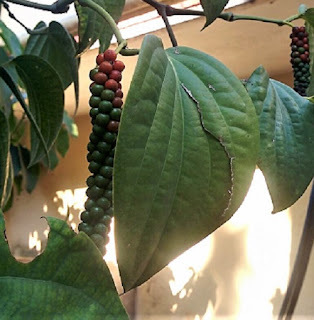 Thanks to Savithri Sumanth for sending the picture of Pepper vine with Peppercorn clusters growing in her garden. 1. 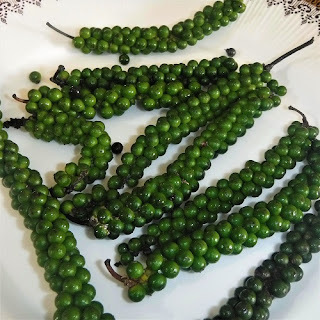 Wash the clusters of green peppercorns with stalk intact and spread them out to drain. 2. Once the water is gone pat them dry with a dry towel. 3. Bring water to a rolling boil and add salt and turmeric powder. 4. Switch off after two minutes and allow to cool, and then squeeze in the juice of lime. 5. Place the pepper clusters in a clean dry jar and pour the brine over them till they are fully covered with brine. 6. Cover with a lid and use the Kurumilagu Oorugai after two days. 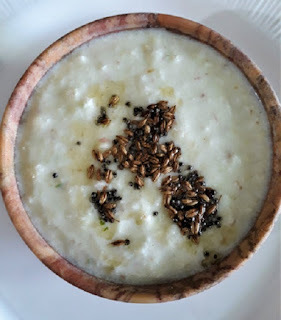 Enjoy the Kurumilagu Oorugai with Curd rice. Few peppers removed from the stalk and sprinkled on the salad will lend a sharp and tingling zing to the salad. Pickles are an integral part of an Indian meal. 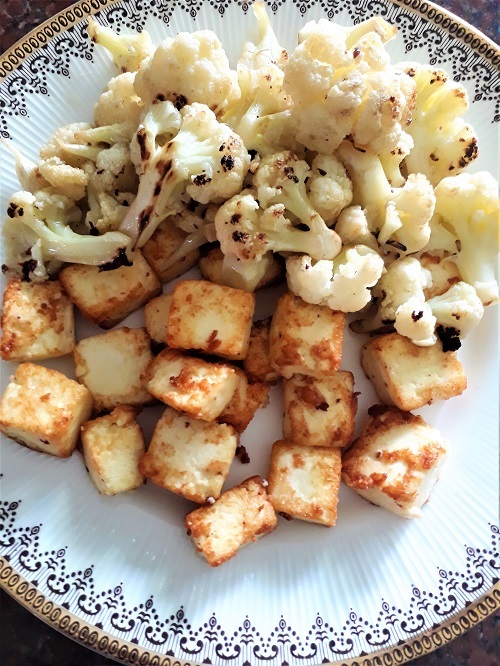 While most of the pickles are meant for long term use, instant pickles using the seasonal produce adds novelty to the meal. 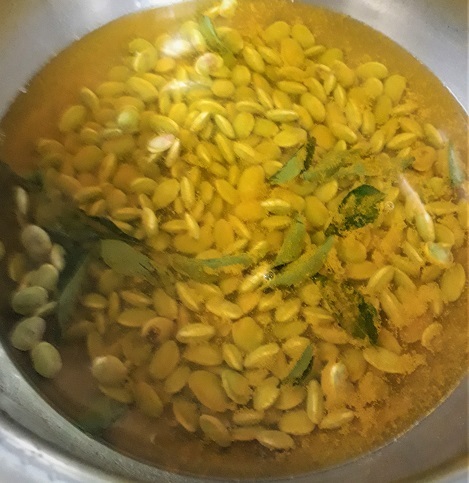 One of the pickles enjoyed during the season is Mango ginger/Mavina Shunti/Manga Inji pickled in lime juice. 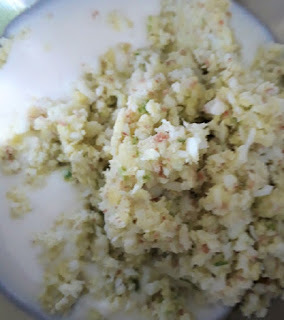 This time I used a portion of the Mango ginger to make a curd based relish popularly known as Thambuli in the Malnad region of Karnataka. 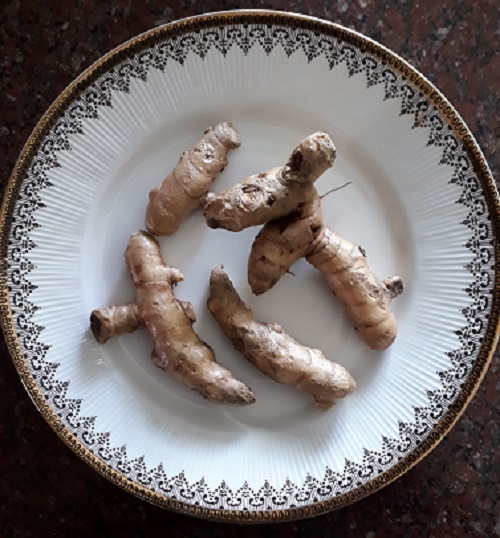 Mango ginger has many health benefits similar to ginger and fresh turmeric. 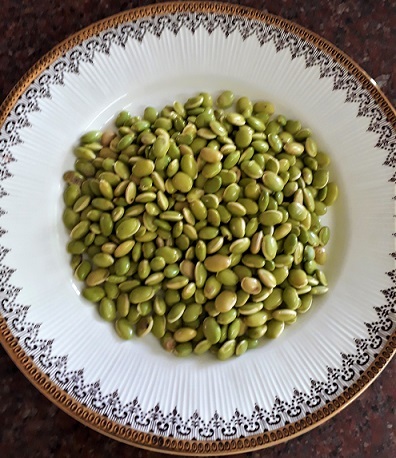 You can imbibe the medicinal properties by consuming the dishes where in the rhizomes are used raw. 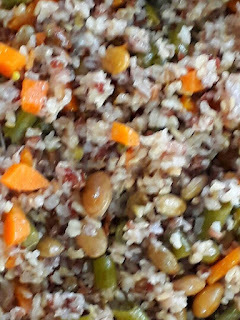 Thambuli is a 'no cooking' dish where all the raw ingredients are combined together. 2. Mix the ground mixture and the sour curds together. 3. Heat the oil and splutter mustard seeds and cumin seeds and pour the seasoning on the Thambuli. Relish the Mavina Shunti Thambuli with hot rice at the beginning of a meal so that it activates your digestive system and triggers your appetite. Enjoy the mango flavour as it explodes in your mouth while you bite the crunchy shreds of Mavina Shunti in the lip smacking Thambuli. Being a die-hard-fan of Avare Kaalu I grabbed a packet of ready to use Avare Kaalu as soon as I saw one on the shelf at a super market. Our home is usually flooded with Kaalu delicacies through out the season. A few decades ago my mother-in-law used to periodically purchase basketsful of Avarekai which were found piled up in heaps all over Malleswaram market. The shiny green fat kaalus were obtained by patiently stringing and peeling the pods with the help of a retinue of helpers. Segregating the clean ones from the ones infested with caterpillars used to be a laborious task. 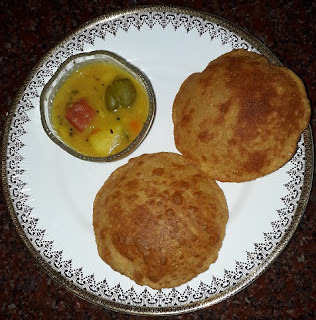 The delicacies prepared using kaalu can be termed as the signature dishes of Bengalooru and Mysuru. 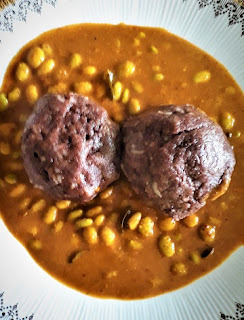 Avare Kaalu Huli ( Kuzhambu) pairs very well with Ragi Muddae, another signature dish of Karnataka. 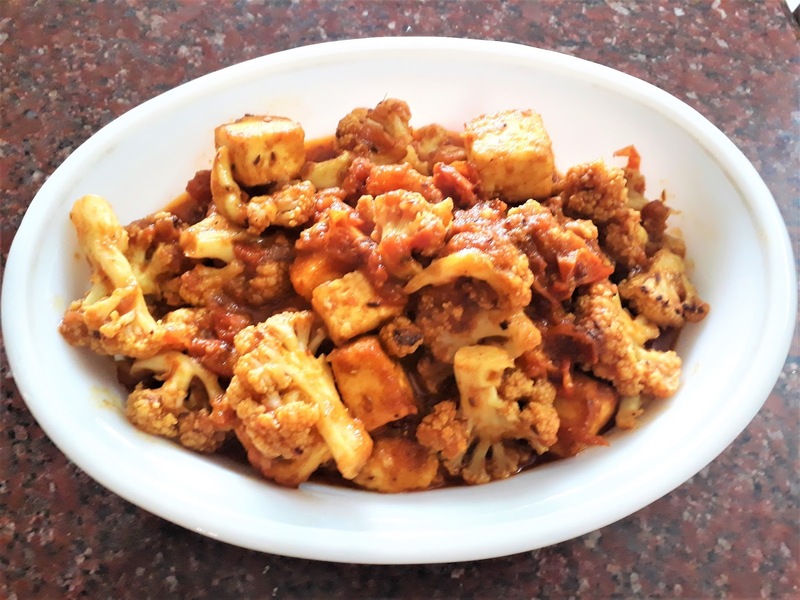 This versatile gravy goes very well with dosas, idlies, and plain rice too. 1. Wash and cook Kaalu in 2 glasses of water adding turmeric powder and curry leaves. 2. 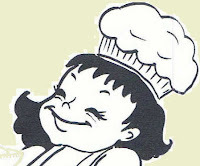 Take care that the beans do not become mushy. 3. 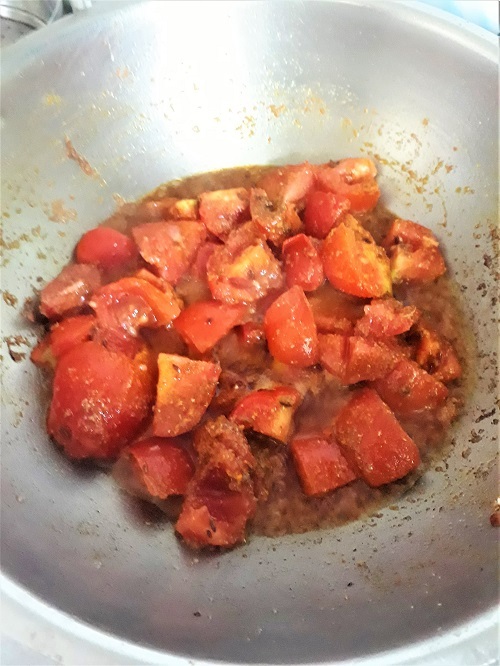 Heat sesame oil in a kadai and fry the cinnamon till it emanates a pleasant aroma. 4. 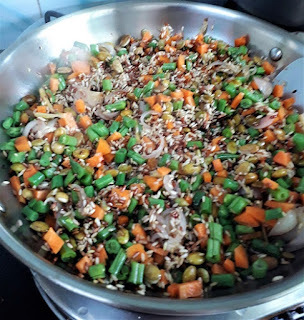 Add coriander seeds, Bengal gram dal, Black gram dal, fenugreek seeds, cumin seeds, asafoetida and the broken red chillies. 5. Roast till it emanates a very pleasant aroma and till the dals turn golden in colour. 6. Roast the coconut gratings till it gives out a pleasant aroma and blend together with the other roasted ingredients into a powder. 7. Add tamarind and again grind them together into a paste adding water. 8. Pour the ground masala into the cooked Kaalu. Add more water as the huli is going to thicken considerably on cooking. 9. 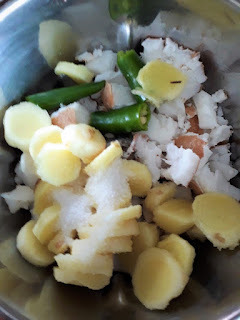 Add salt and jaggery and cook the Huli till it emanates a very pleasant aroma. 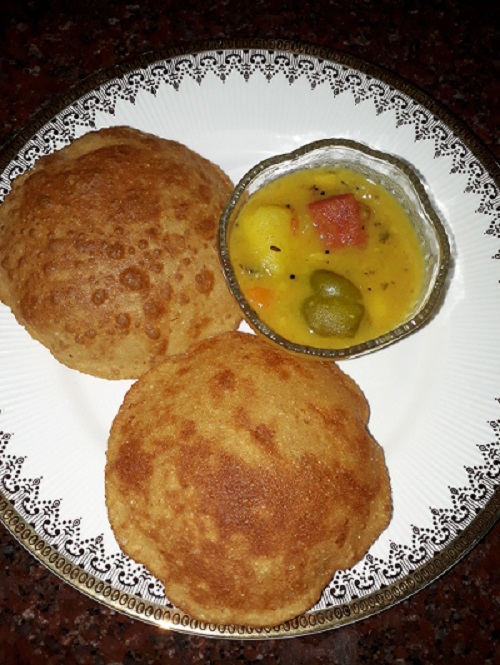 Relish the hot Avare Kaalu Huli with Ragi Muddae, dosas, idlies or even with plain rice.